Note: If you watch BSG, but haven’t seen the last episode (aired on 20090213), skip this post as a spoiler. If you don’t watch BSG, take this post as an example of what you are missing (the quote’s edited so as not to reveal anything). If you saw the episode, enjoy the blockquote. In all your travels, have you ever seen a star super-nova? No. Well I have. I saw a star explode and send out the building blocks of the universe. Other stars, other planets, and, eventually, other life… a supernova. Creation itself. I was there, I wanted to see it, and be part of the moment. And you know how I percieved one of the most glorious events in the universe? With these ridiculous gelatinous orbs in my skull. With eyes designed to percieve only a tiny fraction of the EM spectrum. With ears designed only to hear vibrations in the air. I don’t want to be human! I want to see gamma rays. I want to hear x-rays. I want to smell dark matter. Do you see the absurdity of what I am? I can’t even express these things properly because I have to–I have to conceptualize complex ideas in this stupid, limiting spoken language! But I know I want to reach out with something other than these prehensile paws, and feel the solar wind of a supernova flowing over me. I’m a machine, and I could know much more. I could experience so much more, but I’m trapped in ths absurd body. And why? Because my [creator(s)] thought that God wanted it that way. Five episodes to go until all is revealed. It’s been a mind-blowing ride. 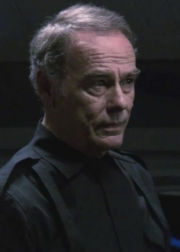 Dean Stockwell did a fabulous job delivering that passage last week.